Tonbridge Rubber Membrane Flat Roofing Installers Kent. Firestone EPDM rubber membrane has a multitude of uses. Great for all roofing repairs and fixing leaking roofs The installed price of your Firestone EPDM rubber membrane will be similar to that of a quality felt roof. And significantly lower than other "newer" systems. And also be very "green". 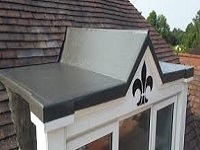 Our Fully Qualified Roofers are also repair specialists and can solve any leaking problems.